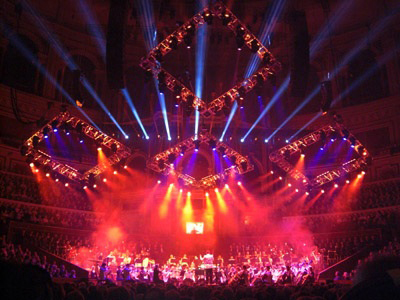 LONDON — A lighting demonstration performed by Durham Marenghi at the Royal Albert Hall put a sampling of Clay Paky gear to the test — Alpha Beam 1500s, Alpha Beam 300s and the long-throw Alpha Wash 1500 LT wash light. The presentation, before a group of LDs, directors of photography, rental managers, production managers, dealers and trade press, consisted of a live show and a technical demonstration. Durham Marenghi performed the live part on the rig he put together for Raymond Gubbay’s bi-annual Classical Spectacular, pictured here, which pairs classical music and modern lighting. Among the Clay Paky instruments, the Alpha Beam 1500 stood out with features that include a concentrated parallel beam, which extends its reach, a patent-pending focusing system and range of effects. The Alpha Beam 300, which has been deployed on tours for Tina Turner, AC/DC, Dancing on Ice, the Cure, High School Musical, Queen + Paul Rodgers and major national TV stations since its 2008 debut, was also featured, as was the Alpha Wash 1500 LT, a wash light designed for long-throw applications. For more information, please visit www.claypaky.it.